Parks and suburban gardens with some tall trees and lawn provide the perfect place for the Australian magpie, where a pair may claim their territory for up to 20 years. While magpies nest high for a good view of the surrounding area, the grassed sections below offer rich pickings for these grub hunters. Male and female magpies can be difficult to tell apart. Both have reddish-brown eyes and similar black and white patches. However, while the neck on the male is white, the nape on the female’s neck is grey-white in colour. Magpies are intelligent, sociable songbirds who use flute-like calls (known as carolling) and bill clicking to communicate. A group may sing a repeated short song at dawn or dusk in winter and spring to broadcast news about the mating season. A pair of magpies may stay together in the same territory for up to 20 years. Why do birds swoop passers-by? Birds swoop to protect their nests and young. 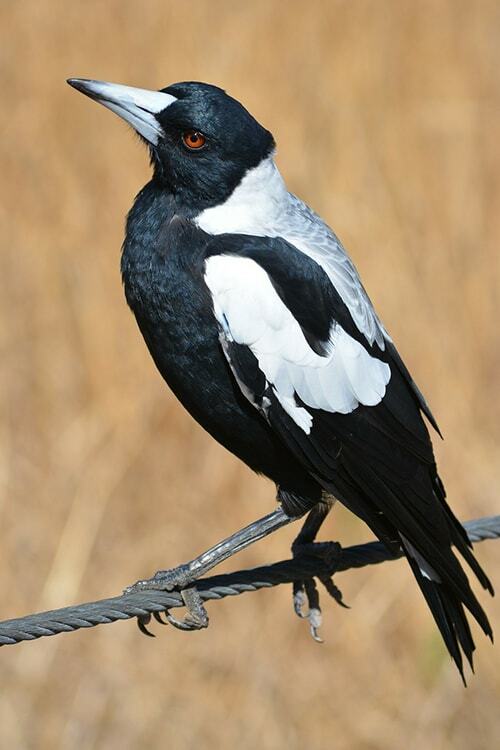 Between July and November some of Lismore’s native bird species, including magpies, may become defensive and swoop people who venture too close to their nesting site. A small percentage of birds strike or swoop as a warning to ward off intruders from their territory. Territories may include your backyard, street, local parkland or school area. This is normal defensive behaviour as the bird is trying to protect their eggs or newly hatched young in their nest. This behaviour usually lasts about six weeks, and in almost all cases ceases when the young leave the nest. The most well-known bird for displaying swooping behaviour is the Australian magpie, however other species of native birds have also been known to swoop including the masked lapwing (plover), butcherbird, magpie-lark, little friarbird, torresian crow and noisy miner. All of these native birds are protected species under state wildlife legislation (the National Parks and Wildlife Act 1974). If you spot a magpie nesting site then stay well clear and even plan alternative routes. Wear sun glasses and a broad-brimmed hat to protect your head and eyes. If a bird swoops while you are cycling get off your bike and walk. Some cyclists have success with attaching zip ties to their helmet. Do not approach a young bird or interfere with the birds or their nest in any way as this will likely increase swooping behaviour. If you are swooped, leave the area quickly but do not run. Watch the birds while walking away - it is less likely to swoop if it knows you're watching. Never harass or provoke birds as this makes them more defensive and may lead to a worse attack next time. Magpies appear to have very good memories and have been known to attack the same people over subsequent seasons while leaving others alone. If it's attacked you before it may be a good idea to use an alternative route - even next season.